Unprecedented access and convenience are yours with a new way to conduct a virtual home tour of your Scottsdale luxury gated home prospect. We place the control at your fingertips with advanced robotics technology. Our one-of-a-kind RoboTour program deploys an actual video-equipped robot inside the listed Scottsdale gated luxury home you want to see. From wherever you are located, you have use of an easy, intuitive control of your robot. You decide where to look, when and for how long. Want to spend more time surveying the kitchen’s layout and design? Go ahead. Maneuver the robot left, right, or turn it 180 degrees. Perhaps you’d like to spend extra time exploring a bedroom’s features, or those in a family area, media room or master bath. Back up and survey an area again. Take as much time as you need. You’re in control. It’s the most advanced and convenient way to virtually tour a home ever available. High tech high touch is the difference. 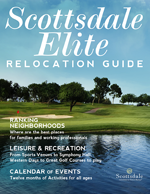 In today’s Arizona luxury home market, technology innovation coupled with personalized service yield you more results in your search for the ideal Scottsdale luxury gated community.